Some of the best things in an admin’s life are indeed free, especially when it comes to backup and virtualization. Beyond star data-protection solutions and other must-have programs, there are quite a few free, yet no-less-powerful, backup tools out there. In this article, I will consider Veeam Backup Free Edition, a handy-dandy backup tool for your Hyper-V VMs that will rock your world. What’s Veeam Backup Free Edition for Hyper-V? Veeam Backup Free Edition is a free, powerful and easy-to-use tool for backing up Hyper-V VMs. It was introduced in 2012 and quickly became popular among virtualization admins. 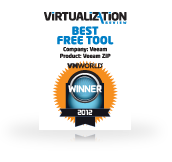 Several months after its launch, Veeam Backup Free Edition was named Best Free Tool in the first annual Virtualization Review VMworld Best of Breed Awards. Today, this free tool’s total number of downloads exceeds 200,000. Why is Veeam Backup Free Edition so wildly popular? Veeam Backup Free is just a free version of the paid solution called Veeam Backup & Replication for Hyper-V, and it provides only a subset of the functionality of the paid edition. However, that subset of functionality is more than enough for most day-to-day Hyper-V VM management. The first core feature is VeeamZIP, which is an ability to create full backups of running Hyper-V VMs, compressed and deduped at a high ratio to save storage space. To better illustrate VeeamZIP, I want to tell you about a friend of mine who works for a company with several remote offices located on different continents. He uses VeeamZIP from Veeam Backup Free Edition to sync new “heavy” Hyper-V VMs (first time) by creating full backups (“VeeamZIPs”) of these VMs, once every several months. My friend saves his backup files to an external USB drive and then sends this drive to a remote office by FedEx (otherwise it would take several weeks to sync these VMs over WAN). Another IT pro friend wisely told me that data protection is not just about backup, but also about recovery. He explained that when disaster strikes, there is no time to think about an appropriate backup method, but that this is when you think about available recovery options. Recovery of Hyper-V VM files such as VHD, VHDX, etc. 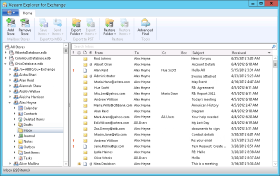 Veeam Explorer for Microsoft Exchange is another cool Veeam Backup Free Edition feature, which might be helpful if you need to recover a separate Exchange item such as a mailbox, message, contact and or other items. The beauty of Veeam Explorer for Microsoft Exchange is that it’s built into Veeam Backup Free Edition (and obviously at no cost), and it doesn’t require a separate license. When it comes to system requirements, Veeam Explorer for Microsoft Exchange works with .EDB files created in Microsoft Exchange 2010 and 2013 (64-bit version). Veeam Explorer for Microsoft SharePoint, which is also built into Veeam Backup Free Edition, was introduced by Veeam in 2013 and has quickly become very popular. It allows you to recover library documents, images and more using an intuitive and user-friendly interface. Supported platforms include Microsoft SharePoint 2010 and 2013. I won’t list all the other incredible features in Veeam Backup Free Edition for Hyper-V, but if you really want to know more, check out the detailed description in the User Guide. Veeam Backup Free Edition distinguishes itself from other free and paid Hyper-V tools because, among other things, it has no expiration date and no limit on the number of VMs. This means Veeam Back Free Edition is likely to be helpful in virtual environments of all sizes. For example, if you work for a nonprofit organization or a small company with a tiny budget, Veeam Backup Free Edition can be used as a main data protection and disaster recovery tool for your Hyper-V VMs. And if you’re responsible for a very large virtual environment, then you probably already have another data-protection solution. But wait! Veeam Backup Free Edition could still be helpful here because of features such as easy item-level recovery for Microsoft Exchange and Microsoft SharePoint. How do you download Veeam Backup Free Edition? Easy! Download Veeam Backup Free Edition (809MB) and install it. No license is required. A parting thought: Veeam Backup Free Edition also supports VMware vSphere — a big topic for another blog post! Have you already tried Veeam Backup Free Edition? Which features do you like or dislike? Please share your thoughts on Twitter; I’d love to get your feedback!